The summer is coming to an end and that means two things. It is time to eat as much watermelon as you can before the Fall hits and next week is Shark week. 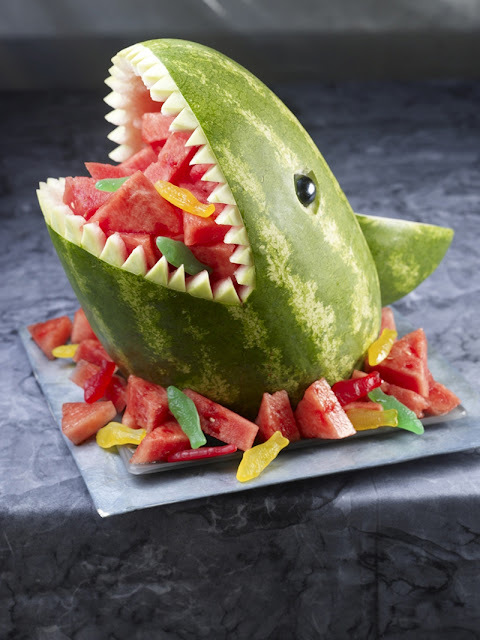 So why not kill two birds with one stone and make yourself a watermelon shark to celebrate. You can get the carving instructions over at the National Watermelon Promotion Board. And you can check out more fun shark ideas HERE. Next week is Shark week, so in honor of all of you (aka my SIL) who love Shark week, these cake pops from a are for you. oh my gosh, this is the coolest thing ever. My son would go crazy for that shark (which he calls "shark attacks") and I just go crazy for Swedish fish any time. I LOVE IT!!! I do the basket all the time. This is a great twist!